The Realtors® Association of the Palm Beaches and Greater Fort Lauderdale (RAPB + GFLR) are looking forward to their 7th Annual Barrier Free 5K Race on Saturday, February 9th at the Barrier Free Park in Boynton Beach. The proceeds of the 5K will go towards the expansion of the Congress Avenue Barrier Free Park, a park designed to accommodate individuals with disabilities. His mother, Jennifer, considers Nathan her miracle baby. Jennifer suffered from a ruptured appendix during her sixth month of pregnancy, endured eight hours of intensive surgery, was in a coma for eight days, and remained in the hospital for 24 days. Both were given low chances of survival. Nathan was born on December 17, 2009 and was not expected to live 10 days. After spending two and half months in the NICU, Nathan went home. He is now nine years old and has exceeded all expectations. 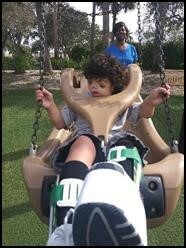 Surviving multiple cranial, facial and orthopedic surgeries, Nathan is now able to utilize a walker. When you meet Nathan, you meet an extremely happy little boy who loves music and anything that vibrates. He is happiest when he is rolling on the floor, side to side, with one of his favorite musical toys. Although completely blind and partially deaf, Nathan is an extremely strong and active little boy. Nathan goes to school at the Royal Palm School and has a sister that he completely adores. If you are interested in participating in the 7th Annual Barrier Free 5K or would like to make a donation towards the Congress Avenue Barrier Free Park, visit barrierfree5k.pbrace.com.